Spring Webservices encourages a contract first, message oriented approach to creating Webservices. The underlying details are completely under developer control starting from the contract to the marshalling/unmarshalling details to the endpoint handling the request. Let us start by an example of a simple service to expose as a webservice - call it the MemberService. MemberService exposes one operation “Get Member Details” which returns the details of a member/person, given an identifier. MemberResponse message comprises of MemberDetail type to represent the details of a member. 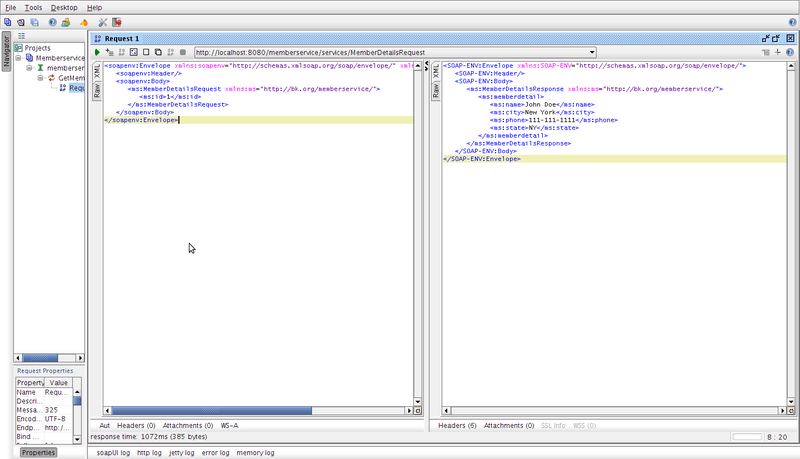 A Spring-WS endpoint processes the XML message and produces the XML response. Spring provides different Endpoints based on how the XML is to be handled. If you wish to handle raw xml you have the option of implementing AbstractDom4jPayloadEndpoint, AbstractDomPayloadEndpoint, AbstractJDomPayloadEndpoint etc, based on how the raw xml needs to be handled. If you wish to handle the XML message as an object representation then you can implement the AbstractMarshallingPayloadEndpoint, which is what I will be using for this example along with JIBX as the XML binding framework for its ease of use and performance. The structure of the Endpoint is very simple, it takes an Object which can be cast to MemberDetailsRequest a holder for the request, and the response is returned as an instance of MemberDetailsResponse, a holder for the response details. JiBX requires a compile step with the above binding file, this is very easily wired using Maven as the build tool. This would direct all requests starting with serivces/* to be handled by Spring-WS. Now, when the request comes in for the URI /memberservice/MemberDetailsRequest.wsdl, Spring-WS would serve out the static memberservice.wsdl. This completes the Webservice implementation. It can be further enhanced to handle the Exception scenarios, Security etc which is an exercise for another day. Spring-WS provides a compelling way to create a webservice with a contract first approach. The amount of code appears extensive, however there is clean separation of the contract defined by the WSDL and the implementation, thus being able to change underlying implementation without affecting the contract.